Roland has a trio of new synthesizers called the Boutique Series. They are affordable miniaturized versions of three classic analog synths from the early 80’s. Say hello to the sweet electronic sounds of the good old days. The synths are modeled after the Jupiter 08 from 1981, the JX-3P from 1983, and the Juno-106 from 1984. Each one is a separate module than can be connected to an external keyboard or docked on Roland’s own adorable mini one. As synths go, these things are relatively affordable. They range from $300-400, and $99 for the keyboard dock. Not super cheap, but within reach for amateur musicians who want to rock out to some amazing retro electronic sounds. Each one features preset sounds that you can tweak and modulate, as well as a step sequencer. They are powered either via USB or using AA batteries. As someone who is constantly electrified (eh?) by the sounds of analog synths, it’s a gift to be able to actually bring some of this stuff into my home without spending insane amounts of money or filling my home to the brim with gadgets. Roland certainly isn’t the first company to bring their legacy products into modern times. Korg’s MS-20 got a shink-down in 2013, and Roland’s own Aira setup was inspired by the influential TR-808 drum machine. 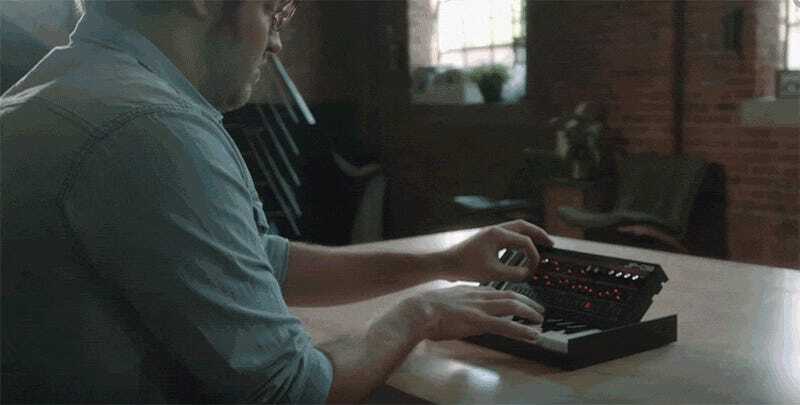 Then you have companies like Teenage Engineering taking entirely new approaches to synthesizers with the insanely fun Pocket Operators and OP-1. For a more detailed breakdown of the Boutique Series, head over to Create Digital Music. You can pre-order the modules now and they should be shipping by the end of October.